How to Make a Homemade Tambourine. Music is a great way to entertain children, and they love to make noise. If you are looking for an easy craft your child can do, or you need a project for a music or Sunday school class, consider making a homemade tambourine. 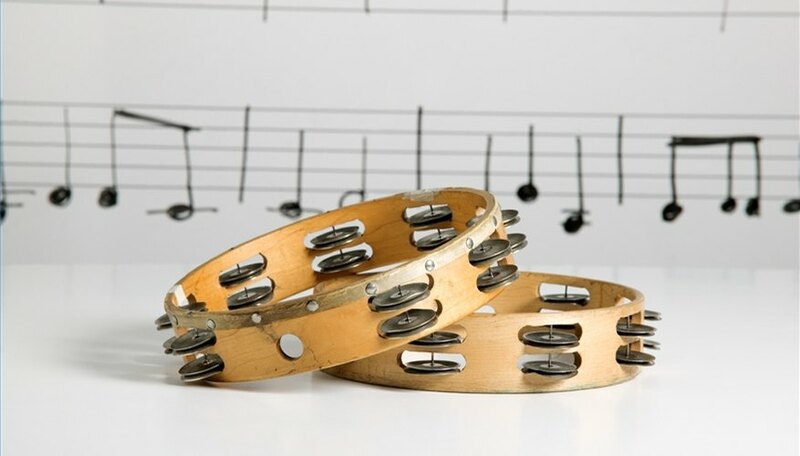 Follow these simple steps to make your homemade tambourine project simple and fun. Purchase disposable aluminum pie tins or thick paper or plastic plates. You will need two plates for each child. Punch holes through the rims of one pie plate every one inch or so. Put the plates together and mark your holes on the second plate. Punch holes at every mark on the second plate with a standard hole puncher. Decorate the bottom sides of the plates as they will become the outside parts of your tambourine. Use buttons, pebbles, beans or popcorn kernels to fill one pie plate. Place the second plate on top and line up the punched holes with the first plate. Thread yarn or ribbon through a hole and begin lacing the thread over and under each punched hole until finished. Leave some length of ribbon if you'd like, and tie into a knot or bow. Now shake, rattle and roll! Be creative with your decorations. Permanent markers, stickers or pictures glued onto the outside of the pie plates work great. You may string the yarn or ribbon going in the opposite direction as the first time to create an "X" with the ribbons. Use seasonal or theme pictures if making the tambourines for a special occasion or holiday. You may also add bells to the outside to make more noise. Simply thread your yarn or ribbon through the bell in between each punched hole. Be careful when working with small children, as the fillers may be a choking hazard.